Call 732-723-8972 to schedule your first appointment. If you're suffering from hearing loss, Miracle-Ear® can make a positive difference. Our hearing aid center in Middletown has top-of-the-line hearing aids, and we're sure we can find a model that matches your lifestyle. Miracle-Ear is America's most recognized brand of hearing aids, and we'll work to quickly improve your hearing when you visit one of our 1300 locations nationwide. If you're ready to discover and experience the Miracle-Ear® advantage, let us improve your hearing. With Miracle-Ear, you'll get a hearing aid equipped with industry-leading advancements such as what you’ll find in our GENIUS™ Technology. GENIUS™ Technology improves your hearing by using computers to listen for sound in every direction. If you have a smartphone, you can try our apps*, GENIUSlink and mini MEBluConnect Remote, which allow you to control your hearing aid with your phone's touch screen. If you have other devices, such as MP3 players or wide-screen TVs, we can offer you Bluetooth®-equipped hearing aids that communicate with your household electronics via a wireless antenna. For hearing aids in Middletown, NJ, look no further than Miracle-Ear. We'll work with you one-on-one to find a style that gives you what you want. Call us today to speak with one of our hearing care specialists. LaTasha is a Hearing aid dispenser and has been with Miracle-Ear for 11 years. 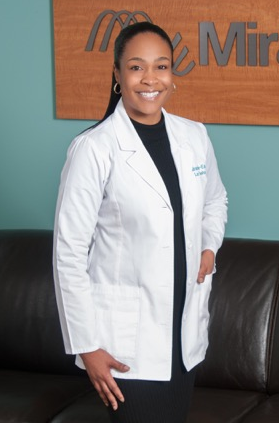 LaTasha has been a certified hearing instrument specialist for over eleven years. LaTasha's favorite part of working for Miracle-Ear is having the ability to help people. I just want to say thank you to LaTasha and Miracle-Ear for making me a whole person again. I lost most of my hearing through aging and radiation. I also felt so out of my social life because I couldn't hear. I had hearing aids made special for me. WOW! Now I can hear everything! I am alive again!! I participate socially, I join into everything, and I am trying new skills too. It's wonderful! The care, knowledge and service that LaTasha and her associate performed to keep aids in top order. They fix any and all problems that arise quickly, thoroughly and so pleasantly. You will never find a more friendly, more knowledgeable company than Miracle-Ear of Middleton. Thank you again! I had a comprehensive evaluation within a gracious and friendly atmosphere. I was very pleased with some e good advice given by La Tasha. I am impressed by her professionalism. Tammy,s manner--always warm and friendly-- makes for a pleasant visit there-- very stress-free! La-Tasha I am writing this letter to thank you for your wonderful service as a Miracle-Ear provider. As you know I originally came to Miracle-Ear as a result of numerous hearing gaps in conversations. My wife was getting tired of repeating herself and I was getting tired of saying "What?" Although examined by Mike, I was advised all follo up exams would be with you. Mike was an efficient and friendly technician and I was sort of disappointed he was not the person I would be dealing with in the future. Those misgivings were quickly erased when I met you. You are a breath of fresh air. Your bright personality together with your expert knowledge of the Miracle-Ear product has made me a truly satisfied customer. My hearing device has filled all the voids, and conversations with my wife are no longer punctuated with arguments over her pronunciation of words and my lack of hearing ability. Thank you for your help in fitting and adjusting the Miracle-Ear until I barely know I'm wearing it. I would like to acknowledge LaTasha Summerlin. I had an appointment on Monday, February 20, 2017. She gave me a hearing test and adjusted my hearing aide. She was professional, courteous and friendly. Sincerely yours, Dominic L.
I’m writing to let you know that I have received excellent care and concern and LaTasha Summerlin has fixed a seemingly damaged hearing aid. That meant a lot to me. I’m 91 years old and it helped me financially. Thank you all and the receptionist Tammy also.